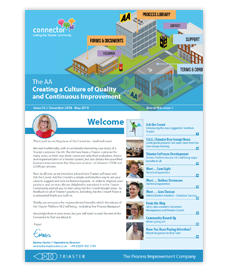 This is such an exciting issue of the Connector - landmark even! We start traditionally, with an extremely interesting case study of a Triaster customer: the AA. The AA have been working with Triaster for many years, so their case study covers not only their evaluation, choice and implementation of a Triaster System, but also details the quantified business improvements that they now achieve - of between £250K and £350K per annum. Next its all new, as we introduce a brand new Triaster software tool: Ask the Crowd. Ask the Crowd is a simple and intuitive way to ask your users to suggest and vote on feature requests - in order to improve your products and services. We are delighted to introduce it to the Triaster Community and ask you to start using Ask the Crowd straight away - to feedback on all of Triaster’s products, including Ask the Crowd! There is a substantial thank you built-in. Thirdly, we announce the unprecedented benefits which the release of the Triaster Platform 18.2 will bring - including free Process Navigator! Amazingly there is even more, but you will need to read the rest of the Connector to find out about it. Missed an edition of the Connector? Please select a year and download now.